Joy Hester - Brighton technical school, Victoria, Australia. Joy Hester was a noted Australian artist who drew and rarely painted, favouring the media of brush and ink. The “Australian Dictionary of Biography” records she was born to Robert Ferdinand Hester and his wife Louise May Hester, née Bracher, at Elsternwick, Victoria, on 21 August, 1920. However, the registration of her birth to Robert and Louise Hester could not be found on the Register of Births for the State of Victoria. Joy St Clair Hester. Born: 21 August 1920. Melbourne, Australia. Died: 4 December 1960 (aged 40) . Melbourne, Australia. Nationality: Australian. Known for: Painting. Movement: Angry Penguins. The marriage of Robert Ferdinand Hester and Louise May Bracher was registered with the Registrar of Marriages for the State of Victoria in 1907. The birth of their first born child, namely, Neville Egerton Hester was also registered with the Registrar of Births for the State of Victoria in the year 1909. In1920, eleven years after the birth of Neville, Joy Hester was born, but the registration of her birth has not been found. Joy abhorred and feared her mother, a schoolteacher, even into adulthood. Her father Robert Ferdinand Hester, Estate Agent, died on 21 June, 1932, from a Cerebral Haemorrhage when she was 11 years of age. Neville Egerton Hester married Mabel Rose Rugg in 1938, and died in 1961. 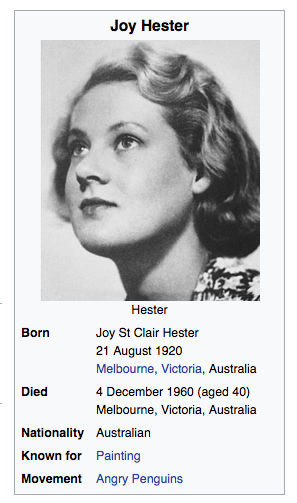 Joy St. Clair Hester was educated at St. Michael’s Church of England Girls’ Grammar School, St. Kilda. Her rudimentary and sporadic art training began with art classes at Brighton Technical School when she was 16. She later attended the National Gallery School where she won first prize (1938) for drawing a head from life. The course was conservative and she abandoned it, preferring to attend life-drawing classes at the Victorian Artists’ Society, East Melbourne. The Contemporary Arts Society was her only venue for showing work until she held her first solo exhibition at the Melbourne Book Club Gallery in 1950. Joy St. Claire Hester, aged 21 years, Telephoniste, married Albert Lee Tucker, aged 26 years, Commercial Artist, in the Church of England at Diamond Creek, Greensborough, on the 1st. January, 1941. At that time Joy Hester was residing at 173 Victoria Parade, East Melbourne, and Albert Tucker was residing at 26 Little Collins Street, Melbourne. Joy first arrived at the near-legendary “Heide” salon, the home of the art patrons John and Sunday Reed in 1942, where she was a contemporary of (Sir) Sidney Nolan, (a former Brighton Technical School student), Arthur Boyd, Charles Blackman, John Perceval and Laurence Hope, and was a member of the “Angry Penguins” group. She was regarded as gregarious, a mimic, an electric presence, generous, earthy and even ribald. She was described as “always a bit of a larrikin” by Janine Burke in her 1983 biography “Joy Hester”. Heide Museum of Modern Art, Bulleen, Victoria. John and Sunday Reed's home where Joy Hester was a frequent guest in the 40s. and 50s. Postcard photograph by David Marks. ​​Albert Tucker described her as having “a marvelously compassionate insight into people”. And for the times she lived in, she was also decidedly sexually adventurous, having several abortions in the mid ‘30s when they were illegal, risky and expensive. ​According to art critic Michael Keon, who knew all the “Heide” artists, Joy Hester was “as much at the heart of the group as anyone”. In 1938, with Sidney Nolan and co. she was a founding member of the Contemporary Art Society, and she first exhibited in its inaugural exhibition in the following year. By the time she died she had produced a body of work “strikingly individual and radical in conception and declaration, unique in how, for the first time, it placed a powerful feminine aesthetic sense at the heart of the overall rejuvenation of the Australian cultural vision which surrounded her”. John, me, (Joy Hester), Sun, Sweeney, Nolan, Pt. Lonsdale, June 1945. Creator : Albert Tucker 1914 - 1999, photographer. Albert Tucker Photographic Collection, Heide Museum of Modern Art and State Library of Victoria. Accession No. H2008.98/124. ​Joy Hester had a son, Sweeney, (1944(5) – 1979), while married to Albert Tucker. In 1947, when Sweeney was three, Joy was diagnosed with terminal Hodgkin’s lymphoma. Believing she had only 2 years to live, she decided to move to Sydney to live with Melbourne artist Gray Smith, and gave her son into the care of John Reed and Sunday Reed, the influential, Melbourne-based art patrons, who subsequently adopted him. Me, (Joy Hester), John, Sun, Sweeney and Nolan, back beach Pt. Lonsdale, June, 1945. Creator : Albert Tucker 1914 - 1999, photographer. Albert Tucker Photographic Collection, Heide Museum of Modern Art and State Library of Victoria. Accession No. H2008.98/127. ​From 1947 to 1949, Joy Hester produced some of her finest drawings : the Face, Sleep and Love series. She exhibited these in 1950, together with a selection of her poems, placed on the walls next to the drawings. Major paintings by Joy Hester are so rare that they almost never come on to the market. There are only eight known works in oil by her. When Pauline and Loy, an oil painting on board, was offered for sale in 2017, for the first time since it had been painted in 1947, the Art Gallery of South Australia did all it could to secure it for its collection. It is regarded as a significant addition to the collection. In 1999, Joy Hester’s Girl with a Book (1956), was sold at Christie’s for $250,000, and while this is an unusually high price for one of her paintings, it indicates that when major works come on the market, they are eagerly sought. Joy Hester's "Figure with Scales". 1957. Source : Art Gallery of New South Wales. ​From 1948 to 1956, Joy lived with Gray Smith in rural Victoria, first at Hurstbridge, then at Avonsleigh and Upwey in the Dandenong Ranges. Following her divorce from Albert Tucker, she married Gray Smith c. 1950. Against medical advice she had two more children. She was in remission from Hodgkin’s disease until 1956, when the symptoms re-appeared. She then spent increasingly long periods in hospital. During her last years she lived at Box Hill, where she had her first studio. There she produced her largest drawings and, for the first time, began regularly signing and dating her work. Joy Hester's "Lovers". Art Collector. ​Joy St Clair Smith, aged 40 years, of 18 Clydesdale Street, Box Hill, died at the Alfred Hospital, Melbourne on the 4th. December, 1960. The cause of death was Acute Peripheral Circulatory Failure – 5 ½ hours, Hodgkin’s Disease – 12 years. She was buried at the Box Hill Cemetery on the 5th. December, 1960. The Death Certificate records Joy Hester was 23 years of age when she married Albert Lee Tucker, and 30 years of age when she married Gray Smith, i.e. c.1950. The Issue from her first marriage was Sweeney, aged 15 years, and the Issue from her second marriage were - Peregrine, 8 years, and Fern, 6 years. Joy Hester’s son, Sweeney, who was placed in the care of John and Sunday Reed in 1947, and later adopted by them, died aged 34 years, on the 29th. March, 1979. He committed suicide in the rear bedroom of factory premises at 88-90 Kay Street, Carlton. His previous home address with his wife and children was 33 Gore Street, Fitzroy. On the 25th. February, 1969, when Sweeney was 24 years of age, he married Pamela Louise James. At the time of Sweeney’s death he was a Gallery Director, and had two sons, Mishka Jules, aged 6 years, and Danila Gabriel, aged 4 years. The Death Certificate records the names of his parents as : “John Reed, Solicitor, and Sunday Reed, maiden name, Baillieu”. The Cause of Death was “Effects of an overdose of drugs”. (His death was registered in the name Sweeney Reed). Joy Hester's "Pauline and Loy : slice of a captivating life". Source : "The Australian". Review. For some time prior to Sweeney’s suicide he was a troubled man, and his behavior was erratic. He was living apart from his wife Pamela and their children. His body was cremated at the Springvale Crematorium on the 31st. March, 1979. “Canberra Times”, Sunday 12 March, 1995, page17 . “Portrait of a Hell-Raiser”. By Yvonne Preston. “The Australian” 12.00 a.m., January 27, 2017. “Joy Hester’s Pauline and Loy – slice of a captivating life”. By Bronwyn Watson. “Art Collector” Issue 17, July – September, 2001. “Joy Hester”. By Janine Burke. “The Age” March 18, 2002. “Image of an artist as a doomed man” by Susan Wyndham. Australian Dictionary of Biography. “Hester, Joy St Clair (1920 – 1960)”. By Janine Burke. ​(21 August, 1920 – 4 December, 1960). Death Certificate, Sweeney Reed, 29 March, 1979. Death Certificate, Joy St. Clair Smith, 4 December, 1960. Death Certificate, Robert Ferdinand Hester, 21 June, 1932. Marriage Certificate, Joy St. Claire Hester and Albert Lee Tucker, 1 January, 1941. Neville Egerton Hester, Birth 1909, Marriage 1938 and Death 1961. Index of Births, Deaths and Marriages in the State of Victoria. Art Gallery of New South Wales. Photographs of art-work by Joy Hester.